Create a unique and exciting experience for your students or group, as you dive into the world of wonder and water with the Aquarium’s education programs. Journey from “North Carolina’s Mountains to the Sea” to be immersed in fun and learning with the Aquarium’s most interesting animals. There are a variety of engaging learning opportunities for your group. 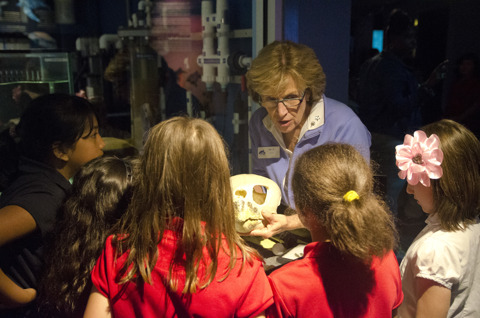 Students can explore the Aquarium on a teacher-led tour, participate in a live animal program in the Big Rock Theater, research exhibits and species with interactive scavenger hunts, or become scientists through hands-on classroom activities or outdoor field experiences. Group discount rates apply to civic organizations, such as nonprofit, religious, community or senior groups, and out-of-state school groups only. These groups of 15 people or more will qualify for 15 percent off admission, when the group registers in advance and purchases all tickets with one payment. A 25 percent discount is available for 50 or more tickets purchased in advance. Register online or call us at 252-247-4003 x290 or x225. Children and teachers/staff in registered North Carolina school groups, including registered North Carolina homeschool groups, are admitted at no charge at the time of the visit to the Aquarium if registered in advance. Advance registration is required for free admission. Register early – the Aquarium is a popular destination and reservations are taken on a first-come, first-served basis. The admission fee for registered parent chaperones is $8 per person. For more information or to register your group call 252-247-4003 x290 or x225.